The price of copper has historically been unstable, and its price increased from the 60-year low of US$0.60/lb (US$1.32/kg) in June 1999 to $3.75 per pound ($8.27/kg) in May 2006. It dropped to $2.40/lb ($5.29/kg) in February 2007, then rebounded to $3.50/lb ($7.71/kg) in April 2007. [better source needed] In February 2009, weakening global demand and a steep fall in commodity prices since the previous year's highs left copper prices at $1.51/lb ($3.32/kg). Numerous copper alloys have been formulated, many with important uses. Brass is an alloy of copper and zinc. 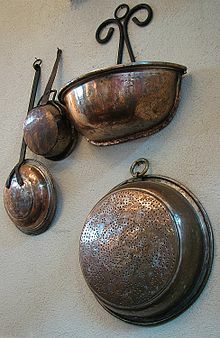 Bronze usually refers to copper-tin alloys, but can refer to any alloy of copper such as aluminium bronze. Copper is one of the most important constituents of silver and karat gold solders used in the jewelry industry, modifying the color, hardness and melting point of the resulting alloys. Some lead-free solders consist of tin alloyed with a small proportion of copper and other metals. Copper forms a rich variety of compounds, usually with oxidation states +1 and +2, which are often called cuprous and cupric, respectively. Copper compounds, whether organic complexes or organometallics, promote or catalyse numerous chemical and biological processes. Copper is used in roofing, currency, and for photographic technology known as the daguerreotype. Copper was used in Renaissance sculpture, and was used to construct the Statue of Liberty; copper continues to be used in construction of various types. 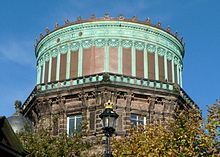 Copper plating and copper sheathing were widely used to protect the under-water hulls of ships, a technique pioneered by the British Admiralty in the 18th century. The Norddeutsche Affinerie in Hamburg was the first modern electroplating plant, starting its production in 1876. 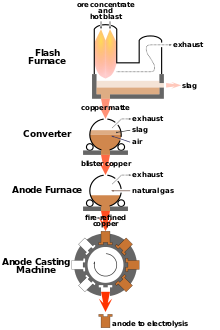 The German scientist Gottfried Osann invented powder metallurgy in 1830 while determining the metal's atomic mass; around then it was discovered that the amount and type of alloying element (e.g., tin) to copper would affect bell tones. During the rise in demand for copper for the Age of Electricity, from the 1880s until the Great Depression of the 1930s, the United States produced one third to half the world's newly mined copper. Major districts included the Keweenaw district of northern Michigan, primarily native copper deposits, which was eclipsed by the vast sulphide deposits of Butte, Montana in the late 1880s, which itself was eclipsed by porphyry deposits of the Souhwest United States, especially at Bingham Canyon, Utah and Morenci, Arizona. Introduction of open pit steam shovel mining and innovations in smelting, refining, flotation concentration and other processing steps led to mass production. Early in the twentieth century, Arizona ranked first, followed by Montana, then Utah and Michigan. Flash smelting was developed by Outokumpu in Finland and first applied at Harjavalta in 1949; the energy-efficient process accounts for 50% of the world's primary copper production. Copper-alloy touch surfaces have natural properties that destroy a wide range of microorganisms (e.g., E. coli O157:H7, methicillin-resistant Staphylococcus aureus (MRSA), Staphylococcus, Clostridium difficile, influenza A virus, adenovirus, and fungi). Some 355 copper alloys[clarification needed] were proven to kill more than 99.9% of disease-causing bacteria within just two hours when cleaned regularly. 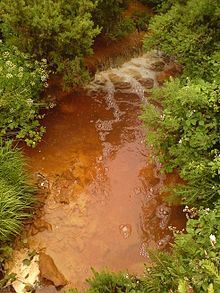 The United States Environmental Protection Agency (EPA) has approved the registrations of these copper alloys as "antimicrobial materials with public health benefits"; that approval allows manufacturers to make legal claims to the public health benefits of products made of registered alloys. In addition, the EPA has approved a long list of antimicrobial copper products made from these alloys, such as bedrails, handrails, over-bed tables, sinks, faucets, door knobs, toilet hardware, computer keyboards, health club equipment, and shopping cart handles (for a comprehensive list, see: Antimicrobial copper-alloy touch surfaces#Approved products). Copper doorknobs are used by hospitals to reduce the transfer of disease, and Legionnaires' disease is suppressed by copper tubing in plumbing systems. Antimicrobial copper alloy products are now being installed in healthcare facilities in the U.K., Ireland, Japan, Korea, France, Denmark, and Brazil and in the subway transit system in Santiago, Chile, where copper-zinc alloy handrails will be installed in some 30 stations between 2011 and 2014. Textile fibers can be blended with copper to create antimicrobial protective fabrics. Copper may be used as a speculative investment due to the predicted increase in use from worldwide infrastructure growth, and the important role it has in producing wind turbines, solar panels, and other renewable energy sources . Another reason predicted demand increases is the fact that electric cars contain an average of 3.6 times as much copper as conventional cars, although the effect of electric cars on copper demand is debated. Some people invest in copper through copper mining stocks, ETFs, and futures. Others store physical copper in the form of copper bars or rounds although these tend to carry a higher premium in comparison to precious metals. Those who want to avoid the premiums of copper bullion alternatively store old copper wire, copper tubing or American pennies made before 1982. For U.S. food and dietary supplement labeling purposes the amount in a serving is expressed as a percent of Daily Value (%DV). For copper labeling purposes 100% of the Daily Value was 2.0 mg, but as of May 27, 2016[update] it was revised to 0.9 mg to bring it into agreement with the RDA. A table of the old and new adult Daily Values is provided at Reference Daily Intake. The original deadline to be in compliance was July 28, 2018, but on September 29, 2017 the FDA released a proposed rule that extended the deadline to January 1, 2020 for large companies and January 1, 2021 for small companies. ^ McHenry, Charles, ed. (1992). The New Encyclopedia Britannica. 3 (15 ed.). Chicago: Encyclopedia Britannica, Inc. p. 612. ISBN 978-0-85229-553-3. ^ "Copper". Merriam-Webster Dictionary. 2018. Retrieved 22 August 2018. ^ Johnson, MD PhD, Larry E., ed. (2008). "Copper". Merck Manual Home Health Handbook. Merck Sharp & Dohme Corp., a subsidiary of Merck & Co., Inc. Retrieved 7 April 2013. ^ "Copper in human health". ^ a b George L. Trigg; Edmund H. Immergut (1992). Encyclopedia of applied physics. 4: Combustion to Diamagnetism. VCH Publishers. pp. 267–272. ISBN 978-3-527-28126-8. Retrieved 2 May 2011. ^ Smith, William F. & Hashemi, Javad (2003). Foundations of Materials Science and Engineering. McGraw-Hill Professional. p. 223. ISBN 978-0-07-292194-6. ^ a b c Hammond, C.R. (2004). The Elements, in Handbook of Chemistry and Physics (81st ed.). CRC press. ISBN 978-0-8493-0485-9. ^ Resistance Welding Manufacturing Alliance (2003). Resistance Welding Manual (4th ed.). Resistance Welding Manufacturing Alliance. pp. 18–12. ISBN 978-0-9624382-0-2. ^ Chambers, William; Chambers, Robert (1884). Chambers's Information for the People. L (5th ed.). W. & R. Chambers. p. 312. ISBN 978-0-665-46912-1. ^ "Galvanic Corrosion". Corrosion Doctors. Retrieved 29 April 2011. ^ a b Grieken, Rene van; Janssens, Koen (2005). Cultural Heritage Conservation and Environmental Impact Assessment by Non-Destructive Testing and Micro-Analysis. CRC Press. p. 197. ISBN 978-0-203-97078-2. ^ "Copper.org: Education: Statue of Liberty: Reclothing the First Lady of Metals – Repair Concerns". Copper.org. Retrieved 11 April 2011. ^ Rickett, B.I. ; Payer, J.H. (1995). "Composition of Copper Tarnish Products Formed in Moist Air with Trace Levels of Pollutant Gas: Hydrogen Sulfide and Sulfur Dioxide/Hydrogen Sulfide". Journal of the Electrochemical Society. 142 (11): 3723–3728. doi:10.1149/1.2048404. ^ "Interactive Chart of Nuclides". National Nuclear Data Center. Retrieved 8 April 2011. ^ Okazawad, Hidehiko; Yonekura, Yoshiharu; Fujibayashi, Yasuhisa; Nishizawa, Sadahiko; Magata, Yasuhiro; Ishizu, Koichi; Tanaka, Fumiko; Tsuchida, Tatsuro; Tamaki, Nagara; Konishi, Junji (1994). "Clinical Application and Quantitative Evaluation of Generator-Produced Copper-62-PTSM as a Brain Perfusion Tracer for PET" (PDF). Journal of Nuclear Medicine. 35 (12): 1910–1915. PMID 7989968. ^ Romano, Donatella; Matteucci, Fransesca (2007). "Contrasting copper evolution in ω Centauri and the Milky Way". Monthly Notices of the Royal Astronomical Society: Letters. 378 (1): L59–L63. arXiv:astro-ph/0703760. Bibcode:2007MNRAS.378L..59R. doi:10.1111/j.1745-3933.2007.00320.x. ^ a b c d Emsley, John (2003). Nature's building blocks: an A–Z guide to the elements. Oxford University Press. pp. 121–125. ISBN 978-0-19-850340-8. Retrieved 2 May 2011. ^ Rickwood, P.C. (1981). "The largest crystals" (PDF). American Mineralogist. 66: 885. ^ Randazzo, Ryan (19 June 2011). 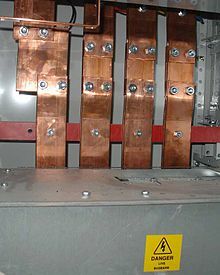 "A new method to harvest copper". Azcentral.com. Retrieved 25 April 2014. ^ Gordon, R.B. ; Bertram, M.; Graedel, T.E. (2006). "Metal stocks and sustainability". Proceedings of the National Academy of Sciences. 103 (5): 1209–1214. Bibcode:2006PNAS..103.1209G. doi:10.1073/pnas.0509498103. PMC 1360560. 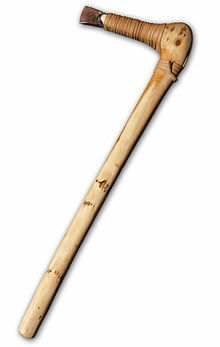 PMID 16432205. ^ a b Leonard, Andrew (2 March 2006). "Peak copper?". Salon – How the World Works. Archived from the original on 7 March 2008. Retrieved 23 March 2008. ^ Brown, Lester (2006). Plan B 2.0: Rescuing a Planet Under Stress and a Civilization in Trouble. New York: W.W. Norton. p. 109. ISBN 978-0-393-32831-8. ^ "Copper Trends: Live Metal Spot Prices". Archived from the original on 1 May 2012. ^ Watling, H.R. (2006). "The bioleaching of sulphide minerals with emphasis on copper sulphides — A review" (PDF). Hydrometallurgy. 84 (1): 81–108. doi:10.1016/j.hydromet.2006.05.001. Archived from the original (PDF) on 18 August 2011. ^ Burton, Julie McCulloch (2015). Pen to Paper: Making Fun of Life. iUniverse. ISBN 978-1-4917-5394-1. ^ Bahadir, Ali Mufit; Duca, Gheorghe (2009). The Role of Ecological Chemistry in Pollution Research and Sustainable Development. Springer. ISBN 978-90-481-2903-4. ^ Green, Dan (2016). The Periodic Table in Minutes. Quercus. ISBN 978-1-68144-329-4. ^ "Overview of Recycled Copper" Copper.org. (25 August 2010). Retrieved on 8 November 2011. ^ "Gold Jewellery Alloys". World Gold Council. Archived from the original on 14 April 2009. Retrieved 6 June 2009. ^ Balver Zinn Solder Sn97Cu3 Archived 7 July 2011 at the Wayback Machine. (PDF) . balverzinn.com. Retrieved on 8 November 2011. ^ Corrosion Tests and Standards. ASTM International. 2005. p. 368. ^ Oguchi, Hachiro (1983). "Japanese Shakudō: its history, properties and production from gold-containing alloys". Gold Bulletin. 16 (4): 125–132. doi:10.1007/BF03214636. ^ a b c Holleman, A.F. ; Wiberg, N. (2001). Inorganic Chemistry. San Diego: Academic Press. ISBN 978-0-12-352651-9. ^ Trammell, Rachel; Rajabimoghadam, Khashayar; Garcia-Bosch, Isaac (30 January 2019). "Copper-Promoted Functionalization of Organic Molecules: from Biologically Relevant Cu/O2 Model Systems to Organometallic Transformations". Chemical Reviews. 119 (4): 2954–3031. doi:10.1021/acs.chemrev.8b00368. PMID 30698952. ^ a b Wiley-Vch (2 April 2007). "Nonsystematic (Contact) Fungicides". Ullmann's Agrochemicals. p. 623. ISBN 978-3-527-31604-5. ^ Saalwächter, Kay; Burchard, Walther; Klüfers, Peter; Kettenbach, G.; Mayer, Peter; Klemm, Dieter; Dugarmaa, Saran (2000). "Cellulose Solutions in Water Containing Metal Complexes". Macromolecules. 33 (11): 4094–4107. Bibcode:2000MaMol..33.4094S. doi:10.1021/ma991893m. ^ Berná, José; Goldup, Stephen; Lee, Ai-Lan; Leigh, David; Symes, Mark; Teobaldi, Gilberto; Zerbetto, Fransesco (26 May 2008). "Cadiot–Chodkiewicz Active Template Synthesis of Rotaxanes and Switchable Molecular Shuttles with Weak Intercomponent Interactions". Angewandte Chemie. 120 (23): 4464–4468. doi:10.1002/ange.200800891. ^ Rafael Chinchilla & Carmen Nájera (2007). "The Sonogashira Reaction: A Booming Methodology in Synthetic Organic Chemistry". Chemical Reviews. 107 (3): 874–922. 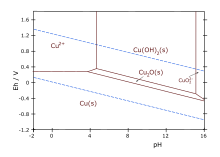 doi:10.1021/cr050992x. PMID 17305399. ^ "An Addition of an Ethylcopper Complex to 1-Octyne: (E)-5-Ethyl-1,4-Undecadiene" (PDF). Organic Syntheses. 64: 1. 1986. doi:10.15227/orgsyn.064.0001. Archived from the original (PDF) on 19 June 2012. ^ Kharasch, M.S. ; Tawney, P.O. (1941). "Factors Determining the Course and Mechanisms of Grignard Reactions. II. The Effect of Metallic Compounds on the Reaction between Isophorone and Methylmagnesium Bromide". Journal of the American Chemical Society. 63 (9): 2308–2316. doi:10.1021/ja01854a005. ^ Imai, Sadako; Fujisawa, Kiyoshi; Kobayashi, Takako; Shirasawa, Nobuhiko; Fujii, Hiroshi; Yoshimura, Tetsuhiko; Kitajima, Nobumasa; Moro-oka, Yoshihiko (1998). 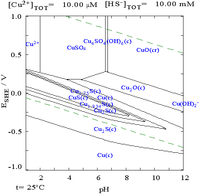 "63Cu NMR Study of Copper(I) Carbonyl Complexes with Various Hydrotris(pyrazolyl)borates: Correlation between 63Cu Chemical Shifts and CO Stretching Vibrations". Inorganic Chemistry. 37 (12): 3066–3070. doi:10.1021/ic970138r. ^ G. Brauer, ed. (1963). 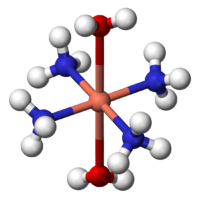 "Potassium Cuprate (III)". Handbook of Preparative Inorganic Chemistry. 1 (2nd ed.). NY: Academic Press. p. 1015. ^ Schwesinger, Reinhard; Link, Reinhard; Wenzl, Peter; Kossek, Sebastian (2006). "Anhydrous phosphazenium fluorides as sources for extremely reactive fluoride ions in solution". 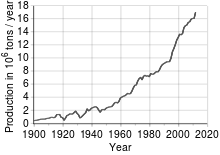 Chemistry: A European Journal. 12 (2): 438–45. doi:10.1002/chem.200500838. PMID 16196062. ^ Lewis, E.A. ; Tolman, W.B. (2004). "Reactivity of Dioxygen-Copper Systems". Chemical Reviews. 104 (2): 1047–1076. doi:10.1021/cr020633r. PMID 14871149. ^ McDonald, M.R. ; Fredericks, F.C. ; Margerum, D.W. (1997). 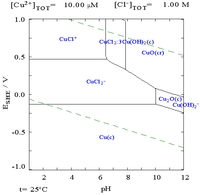 "Characterization of Copper(III)–Tetrapeptide Complexes with Histidine as the Third Residue". Inorganic Chemistry. 36 (14): 3119–3124. doi:10.1021/ic9608713. PMID 11669966. ^ Greenwood, Norman N.; Earnshaw, Alan (1997). Chemistry of the Elements (2nd ed.). Butterworth-Heinemann. p. 1187. ISBN 978-0-08-037941-8. ^ a b "CSA – Discovery Guides, A Brief History of Copper". Csa.com. Retrieved 12 September 2008. ^ Rayner W. Hesse (2007). Jewelrymaking through History: an Encyclopedia. Greenwood Publishing Group. p. 56. ISBN 978-0-313-33507-5. No primary source is given in that book. ^ "Copper". Elements.vanderkrogt.net. Retrieved 12 September 2008. ^ Renfrew, Colin (1990). Before civilization: the radiocarbon revolution and prehistoric Europe. Penguin. ISBN 978-0-14-013642-5. Retrieved 21 December 2011. ^ Cowen, R. "Essays on Geology, History, and People: Chapter 3: Fire and Metals". Retrieved 7 July 2009. ^ Timberlake, S. & Prag A.J.N.W. (2005). The Archaeology of Alderley Edge: Survey, excavation and experiment in an ancient mining landscape. Oxford: John and Erica Hedges Ltd. p. 396. ^ a b "CSA – Discovery Guides, A Brief History of Copper". CSA Discovery Guides. Retrieved 29 April 2011. ^ Dainian, Fan. Chinese Studies in the History and Philosophy of Science and Technology. p. 228. ^ Wallach, Joel. Epigenetics: The Death of the Genetic Theory of Disease Transmission. ^ Radivojević, Miljana; Rehren, Thilo (December 2013). "Tainted ores and the rise of tin bronzes in Eurasia, c. 6500 years ago". Antiquity Publications Ltd.
^ a b McNeil, Ian (2002). Encyclopaedia of the History of Technology. London; New York: Routledge. pp. 13, 48–66. ISBN 978-0-203-19211-5. ^ Rickard, T.A. (1932). "The Nomenclature of Copper and its Alloys". Journal of the Royal Anthropological Institute. 62: 281–290. doi:10.2307/2843960. JSTOR 2843960. ^ Martin, Susan R. (1995). "The State of Our Knowledge About Ancient Copper Mining in Michigan". The Michigan Archaeologist. 41 (2–3): 119. Archived from the original on 7 February 2016. ^ Hong, S.; Candelone, J.-P.; Patterson, C.C. ; Boutron, C.F. (1996). "History of Ancient Copper Smelting Pollution During Roman and Medieval Times Recorded in Greenland Ice". Science. 272 (5259): 246–249 (247f.). Bibcode:1996Sci...272..246H. doi:10.1126/science.272.5259.246. ^ de Callataÿ, François (2005). "The Graeco-Roman Economy in the Super Long-Run: Lead, Copper, and Shipwrecks". Journal of Roman Archaeology. 18: 361–372 (366–369). doi:10.1017/S104775940000742X. ^ Savenije, Tom J.; Warman, John M.; Barentsen, Helma M.; van Dijk, Marinus; Zuilhof, Han; Sudhölter, Ernst J.R. (2000). "Corinthian Bronze and the Gold of the Alchemists" (PDF). Macromolecules. 33 (2): 60–66. Bibcode:2000MaMol..33...60S. doi:10.1021/ma9904870. Archived from the original (PDF) on 29 September 2007. ^ Lynch, Martin (2004). Mining in World History. p. 60. ISBN 978-1-86189-173-0. ^ "Gold: prices, facts, figures and research: A brief history of money". Retrieved 22 April 2011. ^ "Copper and Brass in Ships". Retrieved 6 September 2016. ^ Stelter, M.; Bombach, H. (2004). 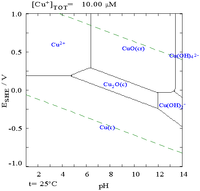 "Process Optimization in Copper Electrorefining". Advanced Engineering Materials. 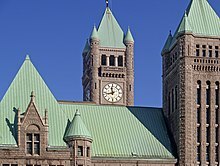 6 (7): 558–562. doi:10.1002/adem.200400403. ^ Gardner, E. D.; et al. (1938). Copper Mining in North America. Washington, D. C.: U. S. Bureau of Mines. Retrieved 19 March 2019. ^ Hyde, Charles (1998). Copper for America, the United States Copper Industry from Colonial Times to the 1990s. Tucson, Arizona: University of Arizona Press. p. passim. ISBN 0-8165-1817-3. ^ "Outokumpu Flash Smelting" (PDF). Outokumpu. p. 2. Archived from the original (PDF) on 24 July 2011. ^ Karen A. Mingst (1976). "Cooperation or illusion: an examination of the intergovernmental council of copper exporting countries". International Organization. 30 (2): 263–287. doi:10.1017/S0020818300018270. ^ Ryck Lydecker. 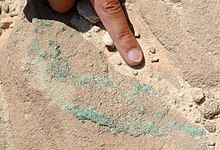 "Is Copper Bottom Paint Sinking?". BoatUS Magazine. Retrieved 3 June 2016. ^ "Copper". American Elements. 2008. Retrieved 12 July 2008. ^ Joseph, Günter, 1999, Copper: Its Trade, Manufacture, Use, and Environmental Status, edited by Kundig, Konrad J.A., ASM International, pp. 141–192 and pp. 331–375. ^ "Copper, Chemical Element – Overview, Discovery and naming, Physical properties, Chemical properties, Occurrence in nature, Isotopes". Chemistryexplained.com. Retrieved 16 October 2012. ^ "Aluminum Wiring Hazards and Pre-Purchase Inspections". www.heimer.com. Retrieved 3 June 2016. ^ "Electrical Wiring FAQ (Part 2 of 2)Section – Aluminum wiring". www.faqs.org. Retrieved 3 June 2016. ^ "Accelerator: Waveguides (SLAC VVC)". SLAC Virtual Visitor Center. Retrieved 29 April 2011. ^ Fuchsloch, J. and E.F. Brush, (2007), "Systematic Design Approach for a New Series of Ultra‐NEMA Premium Copper Rotor Motors", in EEMODS 2007 Conference Proceedings, 10–15 June, Beijing. ^ Berg, Jan. "Why did we paint the library's roof?". Archived from the original on 25 June 2007. Retrieved 20 September 2007. ^ Fitzgerald, K.P. ; Nairn, J.; Atrens, A. (1998). "The chemistry of copper patination". Corrosion Science. 40 (12): 2029–50. doi:10.1016/S0010-938X(98)00093-6. ^ Davis, Joseph R. (2001). Copper and Copper Alloys. ASM International. pp. 3–6, 266. ISBN 978-0-87170-726-0. 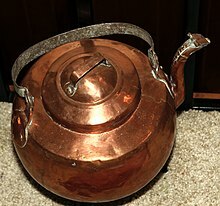 ^ Copper Touch Surfaces Archived 23 July 2012 at the Wayback Machine. Copper Touch Surfaces. Retrieved on 8 November 2011. ^ Biurrun, Amaya; Caballero, Luis; Pelaz, Carmen; León, Elena; Gago, Alberto (1999). "Treatment of a Legionella pneumophila‐Colonized Water Distribution System Using Copper‐Silver Ionization and Continuous Chlorination". Infection Control and Hospital Epidemiology. 20 (6): 426–428. doi:10.1086/501645. JSTOR 30141645. PMID 10395146. ^ Chilean subway protected with Antimicrobial Copper – Rail News from Archived 24 July 2012 at the Wayback Machine. rail.co. Retrieved on 8 November 2011. ^ Codelco to provide antimicrobial copper for new metro lines (Chile)[dead link]. Construpages.com.ve. Retrieved on 8 November 2011. ^ PR 811 Chilean Subway Installs Antimicrobial Copper Archived 23 November 2011 at the Wayback Machine. (PDF). antimicrobialcopper.com. Retrieved on 8 November 2011. ^ "Global copper market under supplied, demand on the rise — report". Mining.com. 6 January 2019. Retrieved 13 January 2019. ^ "Will the Transition to Renewable Energy Be Paved in Copper?". www.renewableenergyworld.com. 15 January 2015. Retrieved 13 January 2019. ^ "Copper and cars: Boom goes beyond electric vehicles". MINING.com. 18 June 2018. Retrieved 13 January 2019. ^ "Impact of electric cars in medium-term copper demand 'overrated', experts say". MINING.com. 12 April 2018. Retrieved 13 January 2019. ^ "Why are Premiums for Copper Bullion So High?". Provident Metals. 20 August 2012. Retrieved 23 January 2019. ^ Chace, Zoe. "Penny Hoarders Hope For The Day The Penny Dies". NPR. NPR. Retrieved 23 January 2019. ^ Walker, W.R.; Keats, D.M. (1976). "An investigation of the therapeutic value of the 'copper bracelet'-dermal assimilation of copper in arthritic/rheumatoid conditions". Agents and Actions. 6 (4): 454–459. PMID 961545. ^ Richmond SJ, Gunadasa S, Bland M, Macpherson H (2013). "Copper bracelets and magnetic wrist straps for rheumatoid arthritis – analgesic and anti-inflammatory effects: a randomised double-blind placebo controlled crossover trial". PLoS ONE. 8 (9): e71529. Bibcode:2013PLoSO...871529R. doi:10.1371/journal.pone.0071529. PMC 3774818. PMID 24066023. ^ Richmond, Stewart J.; Brown, Sally R.; Campion, Peter D.; Porter, Amanda J.L. ; Moffett, Jennifer A. Klaber; Jackson, David A.; Featherstone, Valerie A.; Taylor, Andrew J. (2009). "Therapeutic effects of magnetic and copper bracelets in osteoarthritis: A randomised placebo-controlled crossover trial". Complementary Therapies in Medicine. 17 (5–6): 249–256. doi:10.1016/j.ctim.2009.07.002. ISSN 0965-2299. PMID 19942103. ^ a b Geoffrey Michael Gadd (March 2010). "Metals, minerals and microbes: geomicrobiology and bioremediation". Microbiology. 156 (3): 609–643. doi:10.1099/mic.0.037143-0. PMID 20019082. ^ Harbhajan Singh (2006). Mycoremediation: Fungal Bioremediation. p. 509. ISBN 978-0-470-05058-3. ^ "Fun facts". Horseshoe crab. University of Delaware. Retrieved 13 July 2008. ^ a b S.J. Lippard, J.M. Berg "Principles of bioinorganic chemistry" University Science Books: Mill Valley, CA; 1994. ISBN 0-935702-73-3. ^ Decker, H. & Terwilliger, N. (2000). "COPs and Robbers: Putative evolution of copper oxygen-binding proteins". Journal of Experimental Biology. 203 (Pt 12): 1777–1782. PMID 10821735. ^ Schneider, Lisa K.; Wüst, Anja; Pomowski, Anja; Zhang, Lin; Einsle, Oliver (2014). "Chapter 8. No Laughing Matter: The Unmaking of the Greenhouse Gas Dinitrogen Monoxide by Nitrous Oxide Reductase". In Peter M.H. Kroneck; Martha E. Sosa Torres (eds.). 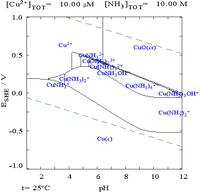 The Metal-Driven Biogeochemistry of Gaseous Compounds in the Environment. Metal Ions in Life Sciences. 14. Springer. pp. 177–210. doi:10.1007/978-94-017-9269-1_8. ISBN 978-94-017-9268-4. PMID 25416395. ^ Denoyer, Delphine; Clatworthy, Sharnel A.S.; Cater, Michael A. (2018). "Chapter 16. 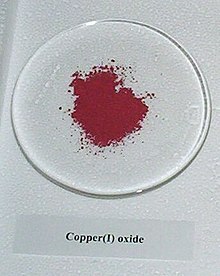 Copper Complexes in Cancer Therapy". In Sigel, Astrid; Sigel, Helmut; Freisinger, Eva; Sigel, Roland K.O. (eds.). Metallo-Drugs: Development and Action of Anticancer Agents. Metal Ions in Life Sciences. 18. Berlin: de Gruyter GmbH. pp. 469–506. doi:10.1515/9783110470734-022. ISBN 978-3-11-047073-4. PMID 29394035. 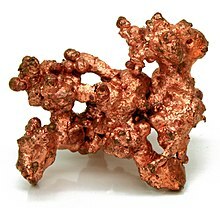 ^ a b "Amount of copper in the normal human body, and other nutritional copper facts". Retrieved 3 April 2009. ^ Adelstein, S. J.; Vallee, B. L. (1961). "Copper metabolism in man". New England Journal of Medicine. 265 (18): 892–897. doi:10.1056/NEJM196111022651806. PMID 13859394. ^ M.C. Linder; Wooten, L.; Cerveza, P.; Cotton, S.; Shulze, R.; Lomeli, N. (1 May 1998). "Copper transport". The American Journal of Clinical Nutrition. 67 (5): 965S–971S. doi:10.1093/ajcn/67.5.965S. PMID 9587137. ^ Frieden, E.; Hsieh, H.S. (1976). 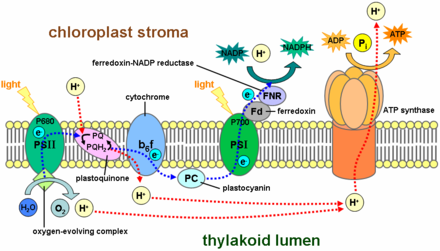 Ceruloplasmin: The copper transport protein with essential oxidase activity. Advances in Enzymology and Related Areas of Molecular Biology. Advances in Enzymology – and Related Areas of Molecular Biology. 44. pp. 187–236. doi:10.1002/9780470122891.ch6. ISBN 978-0-470-12289-1. JSTOR 20170553. PMID 775938. ^ S.S. Percival; Harris, E.D. (1 January 1990). "Copper transport from ceruloplasmin: Characterization of the cellular uptake mechanism". American Journal of Physiology. Cell Physiology. 258 (1): C140–C146. doi:10.1152/ajpcell.1990.258.1.c140. PMID 2301561. ^ Dietary Reference Intakes: RDA and AI for Vitamins and Elements Food and Nutrition Board, Institute of Medicine, National Academies Press, 2011. Retrieved 18 April 2018. ^ Copper. IN: Dietary Reference Intakes for Vitamin A, Vitamin K, Arsenic, Boron, Chromium, Copper, Iodine, Iron, Manganese, Molybdenum, Nickel, Silicon, Vanadium, and Copper. National Academy Press. 2001, PP. 224–257. ^ "Federal Register May 27, 2016 Food Labeling: Revision of the Nutrition and Supplement Facts Labels. FR p. 33982" (PDF). ^ Bonham, Maxine; O'Connor, Jacqueline M.; Hannigan, Bernadette M.; Strain, J.J. (2002). "The immune system as a physiological indicator of marginal copper status?". British Journal of Nutrition. 87 (5): 393–403. doi:10.1079/BJN2002558. PMID 12010579. ^ Li, Yunbo; Trush, Michael; Yager, James (1994). "DNA damage caused by reactive oxygen species originating from a copper-dependent oxidation of the 2-hydroxy catechol of estradiol". Carcinogenesis. 15 (7): 1421–1427. doi:10.1093/carcin/15.7.1421. PMID 8033320. ^ Gordon, Starkebaum; John, M. Harlan (April 1986). "Endothelial cell injury due to copper-catalyzed hydrogen peroxide generation from homocysteine". J. Clin. Invest. 77 (4): 1370–6. doi:10.1172/JCI112442. PMC 424498. PMID 3514679. 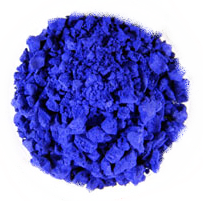 ^ "Pesticide Information Profile for Copper Sulfate". Cornell University. Retrieved 10 July 2008. ^ Hunt, Charles E. & William W. Carlton (1965). "Cardiovascular Lesions Associated with Experimental Copper Deficiency in the Rabbit". Journal of Nutrition. 87 (4): 385–394. doi:10.1093/jn/87.4.385. PMID 5841854. ^ Ayyat M.S. ; Marai I.F.M. ; Alazab A.M. (1995). "Copper-Protein Nutrition of New Zealand White Rabbits under Egyptian Conditions". World Rabbit Science. 3 (3): 113–118. doi:10.4995/wrs.1995.249. ^ Brewer GJ. Copper excess, zinc deficiency, and cognition loss in Alzheimer's disease. BioFactors. March 2012;38(2):107–113. doi:10.1002/biof.1005. PMID 22438177. ^ "Copper: Alzheimer's Disease". Examine.com. Retrieved 21 June 2015. ^ NIOSH Pocket Guide to Chemical Hazards. "#0150". National Institute for Occupational Safety and Health (NIOSH). ^ Bernhard, David; Rossmann, Andrea; Wick, Georg (2005). "Metals in cigarette smoke". Iubmb Life (International Union of Biochemistry and Molecular Biology: Life). 57 (12): 805–809. doi:10.1080/15216540500459667. PMID 16393783. Massaro, Edward J., ed. (2002). Handbook of Copper Pharmacology and Toxicology. Humana Press. ISBN 978-0-89603-943-8. William D. Callister (2003). Materials Science and Engineering: an Introduction (6th ed.). Wiley, New York. Table 6.1, p. 137. ISBN 978-0-471-73696-7. Brass.org – also operated by the Copper Development Association; dedicated to brass, a copper alloy.